Many directory owners are individuals who, in their spare time, manage thousands of members and turn a profit. Managing an online directory website can be a simple hobby, a viable side-business or a full-fledged company. No matter what your initial goal is and regardless of if you’re on your own or if you have a team behind you, you can grow your community to be as large as you’d like… assuming your directory software is up to the task. When first starting your directory website, you want to make sure that the directory software you choose will be able to handle most of the heavy lifting – after all, it’s going to be what will be managing all of your members, listings, payments and more. A directory software is the main platform that will allow you to build and manage your online directory or membership website. Some of these tools are entire cloud-based platforms while others are themes that require you to install them onto your new or existing website. Brilliant Directories has consistently been rated by users as the top directory and membership website software tool since 2010. Brilliant Directories makes it easy to manage your website, members, membership levels, payments, email notifications and more. Over 10,000 groups, organizations and website owners around the world trust Brilliant Directories with their online communities and directory websites. Start your free trial website by clicking here. You’ll be able to have your membership or directory website completely set up and designed in just a few hours. There’s no restrictions – you’ll have access to all of the great features, from member and content management to connecting your payment gateway. I first tried using WordPress themes but the plugins I needed to run my directory website kept breaking. Brilliant Directories is a truly hassle-free, one stop shop platform. If you want to explore more options, listed below are 10 other directory software tools. The list is sorted alphabetically and includes each tool’s major features, price and the level of support you can expect to receive. 360Directories’ price is available upon request – includes website hosting. 360Directories is a standalone directory platform. 360Directories offers general training programs that are developed on an individual basis. 360Directories offers advanced training and website customizations at an additional cost. 360Directories has no available add-ons or plugins. 360Directories does not offer any special discounts. 360Directories has demo videos available prior to purchase, but no demo website or free trial. 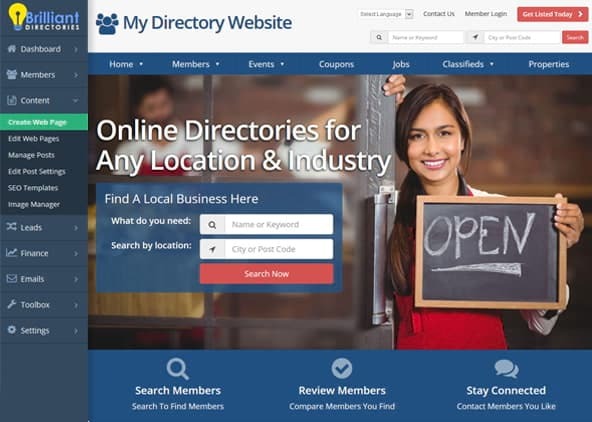 360Directories is a directory software designed for launching local directory websites. It’s specifically geared for promoting businesses and individual members. It’s a good solution for creating local directories, industry-specific directories, membership websites and media directories. 360Directories will allow you to accept recurring payments online, manage members, post articles and more. However, 360Directories does not advertise their price anywhere online, leaving us to believe that there may be some custom development involved and therefore it may not be an immediate turn-key solution. Brilliant Directories’ price start at $95/month or $1,495 one-time – includes website hosting. Brilliant Directories is a turn-key, dedicated directory platform. All Brilliant Directories website plans include top-rated customer support, weekly webinars, video tutorials, support documents and community forum. Brilliant Directories offers optional one-on-one website setup services. Brilliant Directories has optional add-ons available for enhanced functionality. Brilliant Directories typically has ongoing promotions, multi-site discounts & student, nonprofit and US military discounts available. Brilliant Directories websites are mobile-friendly. 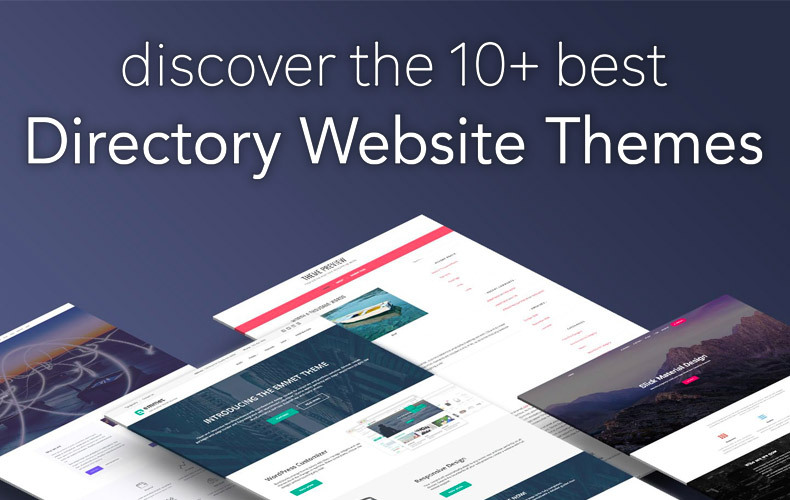 Brilliant Directories has 15+ theme demo sites and a free 7-day trial website is available. Brilliant Directories is the most popular turn-key all-in-one online directory & membership software, currently powering over 20,000 websites. It’s loaded with features for managing members, publishing content, accepting recurring and one-time payments, automated email notifications for members, a full self-service member dashboard, lead management, dynamic SEO templates, integrated Google Maps and so much more. A variety of listings can be published such as business listings, events, properties, products, classified ads, coupons & deals and more. Additionally, members can be reviewed by their customers and security and feature updates are pushed regularly. Crowd Vox’s price starts at $250. Crowd Vox is a PHP script that must be installed on your own server. Crowd Vox provides email support and a user manual. Crowd Vox offers professional installation for $50. Crowd Vox has no available add-ons or plugins. Crowd Vox offers an android app for $350. Crowd Vox has 3 theme demo sites available, but no free trial. Crowd Vox is a more complicated solution for launching an online directory or membership website. It’s a PHP script, meaning you need to already have your own web hosting or server that the script can be installed on. If you’re a website management novice Crowd Vox offers to perform the installation for you for $50. Aside from the required technical knowledge to get the script installed, Crowd Vox does have an interactive dashboard from which you can manage your website. You can manage banner ads, add custom form fields, content filters, listing ratings, events and more. eDirectory’s price starts at $99/month (includes hosting) or $1,499 one-time (hosting costs $29/month). eDirectory is a turn-key, dedicated directory platform. All eDirectory website plans include unlimited email support except for their one-time price plan which includes only 30 days of support. Support documentation and video tutorials are available. eDirectory offers additional modules ranging from $97 – $497. eDirectory does not offer any special discounts. eDirectory has an Android app builder available. eDirectory has a demo available upon request, but no free trial. eDirectory is another all-in-one directory website platform. You can manage your website from an admin portal and members can manage their accounts from their member portal. Members can post deals, events, classifieds and articles. And like with most directory templates, business listings can be rated and reviewed by customers. The DirectoryEngine theme starts at $89. DirectoryEngine is a WordPress theme. EngineThemes offers support documentation and 12 months of email support. EngineThemes does not offer any advanced setup services. DirectoryEngine has extensions that range from $9 – $45. EngineThemes does not offer any special discounts. EngineThemes’ DirectoryEngine WordPress theme is mobile-friendly. DirectoryTheme has a public demo site, but no free trial. EngineThemes’ DirectoryEngine theme is one of the more popular directory themes for WordPress. You can create membership packages, edit design options, use the drag-and-drop content editor, create events and there are many local payment gateways for you to integrate and use to process payments. The main fault with all WordPress directory themes is that they are attempting to use WordPress in ways it was not designed to function. Because of this, several third-party WordPress plugins are typically required to get everything functioning. This can prove to be a large obstacle if certain plugins begin to be incompatible with another or with your theme. Some food for thought: you’ll be relying on code from several different sources, hoping it all works well together. WordPress directory themes are definitely an option, but at the cost of reliability. ezydir costs $1,200. Cloud hosting is available for $99/month. ezydir is a PHP script that must be installed on your own server if you don’t opt for their cloud hosting. ezydir does not offer any support. ezydir offers professional script installation. ezydir has no available add-ons or plugins. ezydir does not offer any special discounts. ezydir WordPress directory theme is mobile-friendly. ezydir has a demo that is available upon request, but no free trial. Similar to Crowd Vox, ezydir is a PHP script that needs to be installed on your own web hosting or server if you do not opt for their cloud hosting. ezydir features basic business listings, articles, events, geo location functionality, an integrated payment gateway, user management, bulk import and export, multi-language support and more. The primary drawback with ezydir, aside from being a PHP script instead of an all-in-one platform, is that no support or updates are offered with the $1,200 price. GoClixy’s price starts at $149. GoClixy is a PHP script that must be installed on your own server. GoClixy provides updates and support for 1 year and can be renewed for $110/year thereafter. GoClixy provides professional installation available for $20. GoClixy has no available add-ons or plugins. GoClixy does not offer any special discounts. GoClixy websites are mobile-friendly. Mobile app creation is available for $40 for Android and $45 for Apple iOS. GoClixy has a demo available upon request, but no free trial. GoClixy is another PHP business directory script that will need to be installed on your own web hosting or server. Despite not being an all-in-one solution, GoClixy does have many features such as bulk import/export, an SMS API, multi-language support, several themes and is ready for AdSense integration in addition to other features. MarketGrabber’s price starts at $499 and optional hosting starts at $29.95/month. MarketGrabber is an online directory script that must be installed on your own server if you don’t opt for their hosting service. MarketGrabber has an array of support plans available. MarketGrabber offers professional installation for $99. MarketGrabber has no available add-ons or plugins. MarketGrabber has multi-license discounts available. MarketGrabber has a demo available upon request, but no free trial. MarketGrabber is a script that requires installation on your own server or you can choose to use MarketGrabber’s hosting service. This is a unique solution because it offers both English and Spanish versions. You can create membership plans, offer multi-listing packages for your members, feature listings, integrate Google Maps and more. phpMyDirectory’s price is $140 to download or $35/month for their hosted solution. phpMyDirectory is a PHP directory script that must be installed on your own server if you don’t opt for their monthly hosted solution. phpMyDirectory’s downloadable version comes with 6 months of updates & support. The monthly hosted option includes updates & support. Premium support is available for $99/month. A user manual is available. phpMyDirectory offers professional installation for $30. phpMyDirectory has add-ons available for $10 each. phpMyDirectory has a public demo site available, but no free trial. phpMyDirectory is a relatively basic directory website solution. It will require some technical knowledge to install it on your server, but feature-wise it’s not overly complicated. phpMyDirectory is comparable in price to some WordPress directory themes, but phpMyDirectory is its own dedicated directory platform, unlike WordPress themes that try to mold WordPress to function as a directory platform. phpMyDirectory does have some unique features compared to other solutions on this list such as RSS feeds, SMS functionality, tax settings and more. Templatic’s Directory Theme starts at $89. Templatic’s Directory Theme is a WordPress theme. Templatic has support documentation available. 1 year of updates and support included with theme purchase. For continued updates and support, you will need to renew your theme license each year at a discounted rate. Templatic offers installation services ranging from $59 – $199. Templatic offers individual add-ons ranging from $29 – $49. Templatic’s plugins pack costs $299. Templatic’s Directory Theme is mobile-friendly. Templatic has a public demo site available for Directory Theme, but no free trial. Templatic’s Directory Theme is another directory theme for WordPress. Templatic offers the same general directory features as most other themes including a booking system, Google Maps, email notifications, bulk import/export and more. Templatic differs from other WordPress themes in that it utilizes many other third-party WordPress plugins. This is both a blessing and a curse. It’s great because these plugins can add greater functionality to your website. However, as previously mentioned, as you add more plugins to a WordPress directory website you increase the risk that the plugins will become incompatible with one another or with your theme. Developers don’t always stay current with pushing updates for their plugins, some updates can cause compatibility issues and your WordPress site is sure to run slower as you install more plugins. Wild Apricot’s price depends on how many members you have, but their plans go up to $350/month. Wild Apricot is a dedicated membership management platform. Wild Apricot offers email, phone and community forum support. Wild Apricot does not offer any advanced setup services. Wild Apricot has no available add-ons or plugins. Wild Apricot does not offer any special discounts. Wild Apricot has Android and Apple iOS apps available. Wild Apricot has a 30-day trial available. Wild Apricot is a membership management software that has been around since 2006. Being around for so long can be a good thing, but Templatic’s themes have not been updated in several years so websites built on Wild Apricot tend to look outdated. Nonetheless, Wild Apricot is a relatively popular platform, but its primary purpose is to manage members, not to turn a profit by helping you manage a profitable directory website. This platform’s main features are member and event management. Because of this, Wild Apricot is typically used by non-profits, homeowner associations, teams, etc. — it’s not so often utilized by online directory websites. How Important Is Source Code Access for Membership and Directory Websites?